If by any chance you happened to be in the city of Maputo, Mozambique, VIP Grand Hotel to be specific, during week beginning 15th November, 2015 and you run into Patrick Okui from Uganda, you would be forgiven for thinking he is just another young man passing hours by attending another function at the hotel. At 33, Okui looks younger than his age; He is slim, soft spoken and has a baby face. It is only when you sit down with him that you realise that the young man is but a deep reservoir of computer networking information. 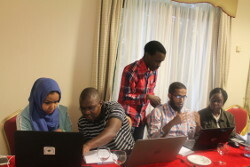 During the said week, Okui is in Maputo as part of the Network Startup Resource Center (NSRC) team delivering a 4-day advanced routing training to 23 networking engineers drawn from the UbuntuNet Alliance NREN Members. The training, which starts Sunday, November 15th, 2015 and runs until Wednesday November 18th, is the latest in the series of engineer capacity building workshop which UbuntuNet Alliance has been offering to network engineers with support from NSRC and the International Network for the Availability of Scientific Publications (INASP). And taking stock of the training on Thursday, November 19th, 2015, the Computer Science graduate from Makerere University does not hesitate to rate it a success. The GBP training is just one of the many areas of networking in which Okui has trained scores of network engineers. Since he formally joined NSRC as a Network Engineer Trainer in 2012, Okui has also taught Network Monitoring and Management, Campus Network Design and Cloud Services to engineers who have gone on to train their peers in their NREN’s. Okui trains the trainer. Okui, who himself started participating in network engineering training workshops before he even joined the university, also points out the Campus Network Design training as one of the important courses that engineers in the capacity building programmes go through. This area, he says, helps engineers design their campus networks efficiently so that it benefits every end user. Networking services is another area of training. Here, says Okui, engineers are equipped with skills on using services like cloud services that can integrate with eduaroam or any other Identity Management services. In this area engineers are trained on how they can provide networking services for a university on a limited budget. So, in what other networking areas do university and NREN networking engineers need to be trained in? According to Okui, the mileage still vary from one NREN to another. “We have NRENs that are advanced in networking engineering because their engineers have been attending many of these meetings but other NRENs have not been participating so there is a need to train them on the areas we have already trained others on. Also, some NREN’s have custom needs so we help them in areas of their asking.” concluded Okui.